My glue gun is one of my most used DIY tools. I use so often that it pretty much just lives on my kitchen counter. And no, I’m not proud of that fact. With all of the various projects I use it on, it ends up getting gunky. Between the glue itself and the rest of the supplies I use, like glitter or feathers, a lot of stuff gets stuck to the tip of the glue gun. Okay, so there’s dog hair stuck in there, too. When you have a long haired white dog, there’s dog hair stuck in everything. And when you have gunky glue, glitter and dog hair, you have to figure out how to clean a glue gun. 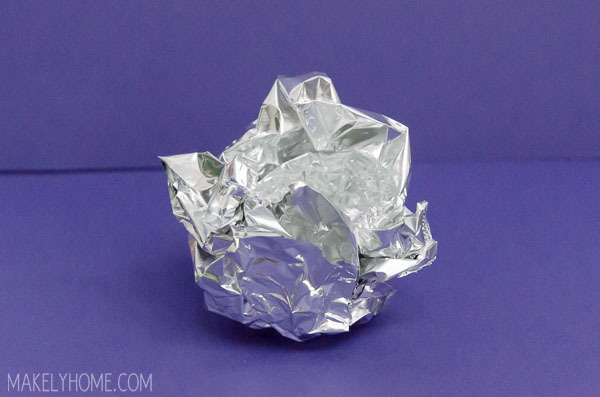 To keep my glue gun clean so that the gunk doesn’t get onto each new project, I occasionally use this high-tech, new fangled contraption – a ball of aluminum foil. While the glue gun is still warm, I also use the foil ball to wipe off anything that got on the body of the gun. It pretty much wipes right off, too. It’s not necessary to clean the glue gun after every project, but cleaning it occasionally will help to keep it in good working condition. It also keeps it from depositing old glitter where glitter shouldn’t be. 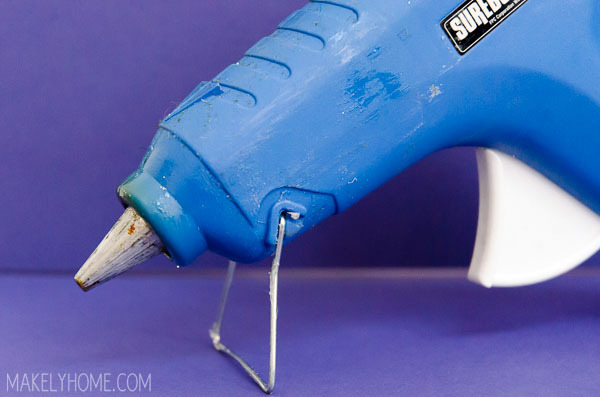 Does your glue gun get gunky? Do you ever clean it? Thanks for this awesome tip! I always wondered how to do this. Thanks for posting this fabulous tip!!! I usually use a paint scraper on it after it is mostly cool. This looks like a much easier option. That is an awesome tip! 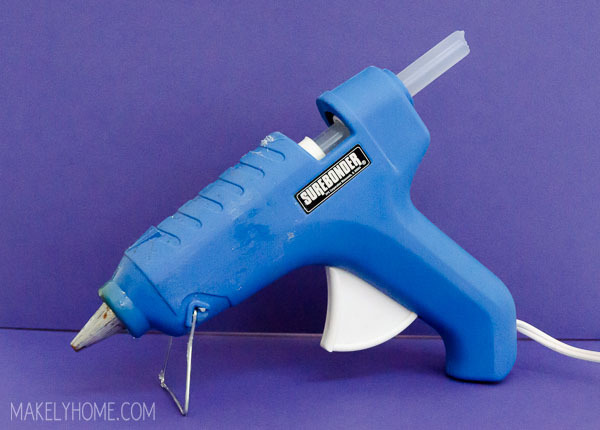 I definitely need to do this to both of my glue guns! Good tip! I’m overdue cleaning up my glue gun. Yours looks about the same size as mine which means it would probably fit just perfectly in one of those cookie tins (like the kind you get full of ginger cookies at Ikean). That has turned out to be the perfect place to tuck it since you can put it in while it is still kinda warm. I just throw the glue sticks in there too. Thank you for the great tip! I found you on Pinterest. My glue gun is older (a gift from someone who used it a lot)…when I got it, it was already covered with glue. I can’t wait to try this to clean it! I never would have thought to use foil. Thanks Lindsay! This is so helpful and you have definitely saved my glue gun from being replaced and saved me money too. I never knew a glue gun could be cleaned, and mine looks way worse. I will definitely be trying this, and pinning it for the future! Thank you for the awesome tip! Thanks so much! I have always needed to clean my glue gun. it has so much funky stuff built up on it over the years it really needs this! I will be doing this next time I use the gun! While I have many times lamented teh deplorable state of my glue gun, I never once thought about attempting to clean all the nastiness off! I’m definitely going to give it a try, but mine has some *serious* funk built up over the years. It may be past redemption. Sounds like you and I have something in common. Mine is in the same condition. Was wondering if there nozzle is black, as mine and was wondering if the foil takes that off as well? 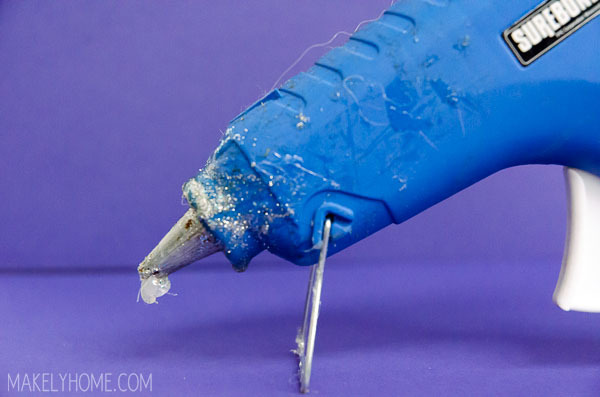 For any residue you can also use iron cleaner on a hot glue gun with the foil and take it an extra step cleaner. 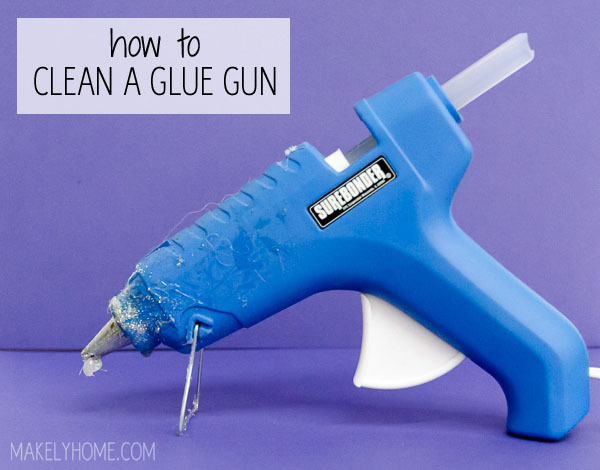 I had no idea how to clean my glue gun!! Wipe glue gun with a dryer sheet while still warm not hot and the stuck in glue will come right off the surface. Wow it really does work. I cleaned 3 glue today. I am ready for new projects. Thanks!